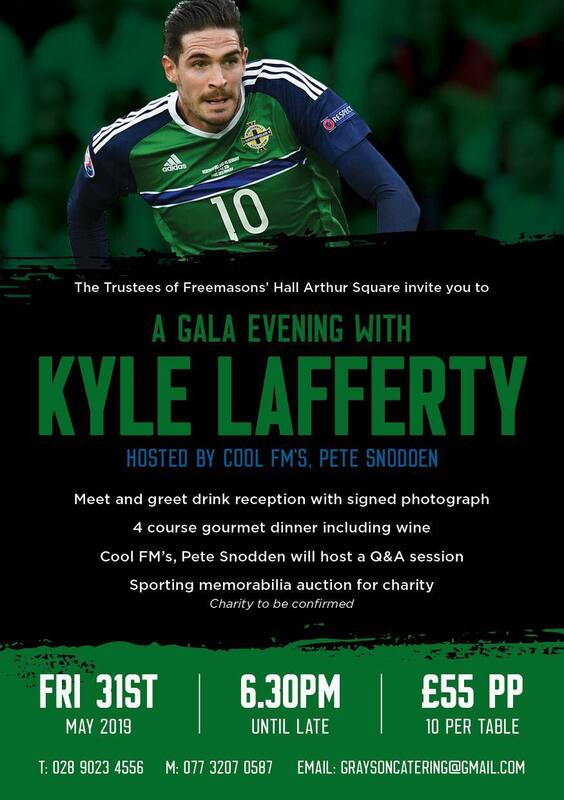 The Trustees of Freemasons' Hall Arthur Square invite you to a Gala Evening with Northern Ireland International Forward - Kyle Lafferty. Hosted by Cool FM's Pete Snodden, the Gala evening will commence with a meet and greet drinks reception with International Footballer Kyle Lafferty. With 70 International caps and 20 International goals, this is a great opportunity to have your photo taken with Kyle and get an autographed photo. After a four course gourmet meal, Pete Snodden will host a Questions and Answers session with Kyle and the evening will conclude with a Sporting memorabilia auction for charity.